Every band concert we go to, the band directors cite studies about the benefits of kids being in band. I don’t think any of us question that kids being in ANY positive activity strengths them and makes them more focused, responsible human beings. Well here is the visual. What I see every single weekday morning at 6:30am!!! 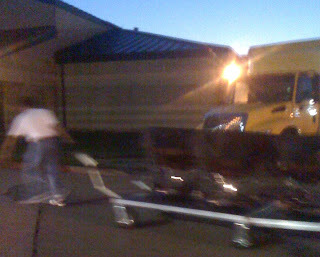 Dressed and at school at 6am, dragging these timpani (and other large instruments) to the football field. Character building indeed. Ok, Litterbugs….what do I tell my baby?? ?